It was another dominant performance by American Pharoah at Oaklawn Park. He did not have the lead this time, but it was of little consequence on his way to an 8 length win over Far Right. Longshot Bridget’s Big Luvy went straight to the lead with American Pharoah breaking well, but relegated back to second. Mr. Z was third, Madefromlucky was in a good spot fourth, and The Truth or Else sat fifth. Win The Space was sixth early on, Bold Conquest was seventh, and the late running Far Right was last of 8 more than 13 lengths behind the leader. Bridget’s Big Luvy continued to lead on the backstretch and into the far turn with Pharoah still in second. The Truth or Else made a bid up the rail to move into the third while Mr. Z was in fourth. Win The Space was fifth and Madefromlucky was asked to make his move from sixth entering the far turn. Far Right was up to seventh and Bold Conquest was back in last. 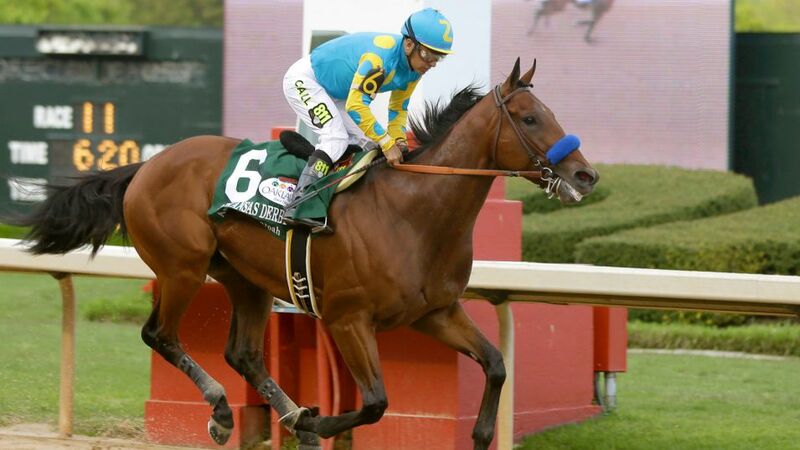 On the far turn, American Pharoah engulfed the leader and took over with Mr. Z making his move right behind him. At this point, it was only a matter of how far American Pharoah would win by as he was under a hand ride throughout the running. A mad dash for second place went to Far Right who came from way out of it to grab second over Mr. Z in third and Madefromlucky in fourth. Bold Conquest finished fifth, Win The Space was sixth, The Truth or Else was seventh, and Bridget’s Big Luvy was last of eight. The entire race can be found here via Equibase. American Pharoah is by Pioneerof The Nile out of the Yankee Gentleman mare Littleprincessemma. He was ridden by Victor Espinoza and is trained by Bob Baffert. He completed the one mile and one eighth in 1:48.52. He paid $2.20 to win, $2.20 to place, and $2.10 to show. For the victory, American Pharoah earned 100 points towards the Kentucky Derby Points Leaderboard to give him a total of 160. Far Right earned 40 points to give him a total of 62, Mr. Z earned 20 points for a total of 34 points, and Madefromlucky earned 10 points for a total of 30. The Road to the Kentucky Derby is now finished. The Kentucky Derby Points Leaderboard is virtually set except for possible defections from now until Kentucky Derby entry day on Wednesday, April 29. Needing a victory to have a chance to make the Kentucky Derby field, Divining Rod delivered under a perfect ride by Julien Leparoux. He won by 3 lengths over the favorite Donworth. Out of the gate, Fame and Power went to the lead with Henry Jones and Divining Rod a length and a half behind. Donworth was also close in fourth. Tiznow R J was fifth, Quimet was sixth, and Comfort was settled in last by 5 1/4 lengths. On the first turn Donworth was three wide and pushed to go up and sit of Fame and Power’s right flank. Divining Rod continued to sit in a perfect spot behind the leaders on the fence with Henry Jones next to him. Tiznow R J was fifth, Quimet was sixth, and Comfort was still last, but beginning to make a move to get closer to the field. Midway through the far turn and entering the stretch, Donworth challenged Fame and Power for the lead, but waiting in the wings was Divining Rod. He came out entering the stretch and went past the two leaders who were no match for the winner. Donworth held on by a nose for second with Fame and Power coming in third. Comfort rallied to be fourth, but was no threat to the top three. Henry Jones finished fifth, Tiznow R J was sixth, and Quimet finished last of 7. The entire chart can be found here via Equibase. Divining Rod is by Tapit out of the Catienus mare Precious Kitten. He was ridden by Julien Leparoux and is trained by Arnaud Delacour. He paid $7.80 to win, $3.60 to place, and $2.40 to show. He completed the 1 1/16 miles in 1:43.29. For the win, Divining Rod earned 10 points to give him 20 points total towards the Kentucky Derby Points Leaderboard. Donworth earned his first 4 points, Fame and Power earned his first 2 points, and Comfort earned his first point. Divining Rod has a chance to make the Kentucky Derby field with his total of 20 points though he is unlikely to enter the Derby. “No, I don’t think so,” owner Roy Jackson said after the race. The draw for the Kentucky Derby will take place on April 29. The Road to the Kentucky Derby has now concluded with the completion of the Grade 3 Lexington Stakes and the Grade 1 Arkansas Derby. The final Road to the Kentucky Derby race will be the Grade 1 Arkansas Derby from Oaklawn Park on Saturday. The other Derby Prep on Saturday will be the Grade 3 Lexington Stakes from Keeneland. The Grade 1 Arkansas Derby will be run at one mile and one eighth on the main track with a purse of $1,000,000. The Arkansas Derby will also offer 100 points to the winner of the race towards the Kentucky Derby Points Leaderboard. Second place will receive 40 points, third place will receive 20 points, and the fourth place finisher will receive 10 points. Post time for the Grade 1 Arkansas Derby is 7:18 PM Eastern time is carded as the 11th of 12 races on Saturday at Oaklawn Park. Free past performances can be found here. 1. The Truth Or Else (15-1 Morning Line) – He broke his start in his fourth start and then finished third in back-to-back graded stakes races (the Grade 1 Champagne and the Grade 2 Nashua). He then hit a bump in the road when he finished a well beaten sixth by 16 lengths in the Grade 2 Remsen. After almost three months off, he came back in the Grade 3 Southwest Stakes to finish second by 3/4 of a length after holding the lead in the stretch. He then raced in the Grade 2 Rebel Stakes, but was no match for American Pharoah while finishing fourth by 10 lengths. He puts the blinkers on for the first time, but he is up against it here from a top two perspective. 2. 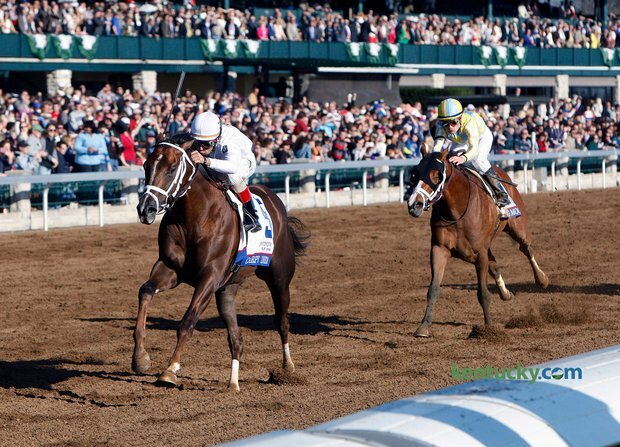 Mr. Z (10-1 ML) – Mr. Z has been a constant participant in the Kentucky Derby prep races. After finishing third by a neck to Dortmund in the Grade 1 Los Alamitos Futurity, he came to Oaklawn for the Smarty Jones Stakes in which he finished 3rd by 2 1/4 lengths after veering out badly in the stretch. In the Grade 3 Southwest he finished third by 3/4 of a length after setting the pace. He then moved south to Louisiana for the Grade 2 Louisiana Derby, but stopped badly after prompting the pace early. The blinkers go back on for this race, but he still seems like an underneath horse at best. 3. Bridget’s Big Luvy (20-1 ML) – It took until his third start to win, but he got it done in the slop by 3/4 of a length at Belmont last October. A three month break between races did not provide any help as he was crushed in the Grade 3 Hutcheson by 25 lengths (finished fifth of 6 horses). After another short break, he reappeared in the Private Terms Stakes and went gate-to-wire by 2 1/2 lengths in the slop again. His best races have been over a muddy track, but he will need a lot more than that to help him here. 4. Madefromlucky (6-1 ML) – He began his career at Monmouth where he went from fifth, to third, to second in his first three races. After four months off, he showed up at Gulfstream Park to win by 4 3/4 lengths. He made it two wins in a row with a length and a half score in an optional claiming $75,000. Last race, he entered the Grade 2 Rebel Stakes and ran into American Pharoah, but still finished second. He once again is a prime candidate to fill out the exacta. 5. Bold Conquest (20-1 ML) – He had a solid 2 year old campaign with a win, two seconds, and a third from four starts including second place in the Grade 3 Iroquois by a neck and third in the Grade 1 Breeders’ Futurity at Keeneland. He resurfaced here at Oaklawn after the Breeders’ Futurity and finished in fourth in the Grade 3 Southwest Stakes after a solid closing kick. His second start off the layoff was the Grade 2 Rebel Stakes, but he was a well beaten third behind American Pharoah and Madefromlucky. Nevertheless, at 20-1 on the morning line he still boasts a solid chance to add value to the underneath exotics. 6. American Pharoah (1-2 ML) – The heavy morning line favorite has been excellent since breaking his maiden. He did that in the Grade 1 Del Mar Futurity by 4 3/4 lengths in gate-to-wire fashion. He then entered the Grade 1 Front Runner at Santa Anita and won by 3 1/4 lengths. After an injury sidelined him, he came back in the Grade 2 Rebel Stakes and dusted the field there as well by 6 1/4 lengths. He is the deserving favorite here and should not have much trouble in this race. 7. Far Right (9-2 ML) – He started his career early in 2014 with a races at Keeneland and Churchill in April and May respectively. He was then switched to trainer Ron Moquett from William Helmbrecht and won his first race in September. He finished his two year old season with a fourth place finish in the Grade 2 Futurity, third in the Street Sense Stakes, and third in the Grade 3 Delta Jackpot. He came back this year and has won two straight in similar fashion. First, he won the Smarty Jones Stakes by 1 3/4 lengths with a rail ride. Then, he came with another strong run in the Grade 3 Southwest to win once more by 3/4 of a length. He is one of the top threats to finish in the exacta. 8. Win The Space (30-1 ML) – He has raced twice, but has yet to break his maiden. His first race was at Santa Anita on February 22 and he was wide on the turn. He finished third by 4 1/4 lengths and then was entered in another maiden race at Santa Anita March 8. He tried to go up the rail in the stretch but could not make a rally. Trainer George Papaprodromou decided to send him to Oaklawn anyway and has taken the blinkers off. This is an interesting spot for this horse, but one that does not lend to him pulling the shocking upset. This race runs through #6 American Pharoah. He should have little trouble with this field, but there are some interesting horses that can finish second and third. #4 Madefromlucky should sit in a perfect spot behind the leaders and could pull the upset if Pharoah falters. #5 Bold Conquest is a big price on the morning line at 20-1, but he can easily spice up the exotics with a late run. #7 Far Right should not be discounted either as he can make a wicked run to finish in the exacta. A recap of the Grade 1 Arkansas Derby will be posted on Saturday night. The Grade 3 Lexington Stakes from Keeneland is one of two Road to the Kentucky Derby prep races on Saturday. The Grade 1 Arkansas Derby from Oaklawn Park is the other race on Saturday. A field of 7 horses will be going one mile and one sixteenth over the main track at Keeneland. The purse for the Lexington Stakes is $250,000. This race is considered a “wild card” race and does not offer nearly as many points as the other races recently. The winner will receive 10 points, second place will receive 4 points, third place will receive 2 points, and fourth place will receive 1 point. The points will go towards the Kentucky Derby Points Leaderboard, but it appears that the winner of this race will need a lot of help to make the Kentucky Derby. Post time for the Grade 3 Lexington Stakes is scheduled for 5:18 PM Eastern Time and is carded as the 10th of 11 races on Saturday. Free past performances can be found here. 1. Divining Rod (3-1 Morning Line) – He started his career in an off the turf event at Laurel Park and broke his maiden that day by 2 3/4 lengths. He was then shipped south for the winter and was third in his turf debut by 2 1/2 lengths. He tried the Grade 3 Sam F. Davis and had a very good run, finishing second by a neck after prompting the pace. In the Grade 2 Tampa Bay Derby, he tried to go gate-to-wire, but was no match for Carpe Diem and finished third. He will have pace pressure on the lead, but gets the key rail position from the start. 2. Comfort (5-1 ML) – He has raced three times in his career with all of those coming at Fair Grounds. He was fourth by 3 lengths in his debut at one mile on turf and then finished fourth again in his second start. He finally broke through in his third start with a 4 1/4 lengths win when switching to dirt. He will have a good running style for this race and is a threat here at a decent price. It is worth noting he is now with trainer Todd Pletcher (was with Pavel Vashchenko). 3. Quimet (8-1 ML) – He finished off the board in back-to-back races to start his career and his first start on dirt resulted in a half-length win. He missed by a length and a half in his fourth start and was then entered in a listed stakes race. He was crushed that day by Materiality and finished fourth by 16 lengths. He met Materiality again in the Florida Derby and did even worse; eighth by 36 lengths. He will need a lot to go his way on Saturday to have a slight chance even with the blinkers going on. 4. Tiznow R J (5-1 ML) – He opened his career with back-to-back third place finishes before winning his third start in stunning fashion by 13 lengths. He was then entered in the Grade 3 Lecomte Stakes and finished a solid third by 2 1/2 lengths. He tried to improve on that race, but was a well beaten 7th in the Grade 2 Risen Star. A trek away from Louisiana brought him to the Grade 3 Sunland Derby, but that resulted in another poor finish; fourth by 17 lengths. He will need to improve to have a chance here. 5. Henry Jones (6-1 ML) – He began his career at Saratoga with two poor turf performances, but the switch to dirt woke him up. He won his first start on dirt at Churchill by a head and then finished third at Keeneland. A five and a half month break did not prevent him from scoring in his return by a length at Oaklawn Park. There are questions about whether or not he can the distance in addition to him probably being on or near the lead. 6. Fame and Power (5-2 ML) – He has raced exclusively in California up to this point. His debut at Del Mar was a good one in which he was second by 2 1/4 lengths, but threw in back-to-back clunkers in his following two races. After almost 2 months between races, he came back and missed by half a length at Los Alamitos. Another break sent him to the bench, but he managed to crush his foes by 4 1/2 lengths going gate-to-wire. He too has speed and will be on the front end, but has never raced beyond 7 furlongs. 7. Donworth (5-1 ML) – He has one race to his credit and it was a very good win by a neck going 7 furlongs at Gulfstream. He was able to overcome a bit of trouble and came off the pace to capture the race against 12 other foes. He is an interesting horse in a race full of speed. This race is chock full of speed with the #1, #5, and #6 all looking like speed horses. #7 Donworth was very professional in his debut coming off the pace to win by a neck and his pedigree says he should relish two turns. #2 Comfort will have a similar running style and is trained by Todd Pletcher now. It is hard to ignore those two horses at a solid 5-1 morning line. #1 Divining Rod will go to the lead and hold on for as long as he can. He probably will not go gate-to-wire, but could hang on for a piece underneath. #6 Fame and Power is trained by Bob Baffert and cannot be discounted on that alone, but the concern is the amount of speed in here. Check back on Saturday evening for a recap of the Grade 3 Lexington Stakes. 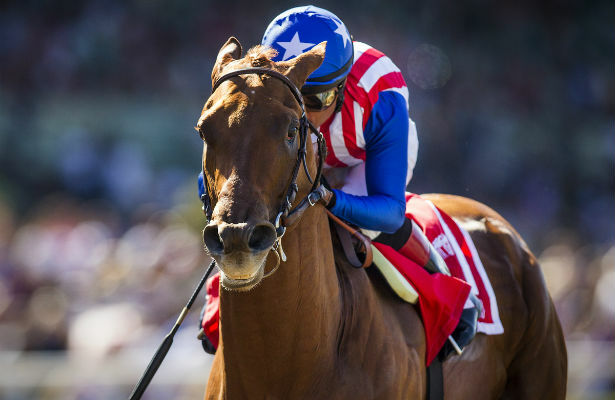 Dortmund remains a perfect six for six in his career after his dominating effort in the Grade 1 Santa Anita Derby. He easily strolled home to a 4 1/4 lengths win over fellow stablemate One Lucky Dane. Dortmund was intent on getting the lead early despite a bit of a stumble out of the gate and he had to work for the lead with an opening quarter mile in 22.46. One Lucky Dane was there as well and Cross the Line pressed him from third. Bad Read Sanchez held the rail in fourth, Prospect Park was fifth, and Bolo was last of six. The trailing trio were at least 2 1/2 lengths behind the leaders leaving them in very good position. Dortmund slowed the race down to 46.36 for the opening half-mile as he held the lead over One Lucky Dane and Cross the Line. Bolo was wide in fourth, Prospect Park was fifth, and Bad Read Sanchez was sixth. Entering the stretch, Dortmund opened up on the field by 4 lengths and maintained that margin until the finish line. One Lucky Dane held his spot in second as Bolo and Prospect Park were unable to close for a better finish. Cross the Line was fifth and Bad Read Sanchez was sixth. The full chart can be found here at Equibase. Dortmund is by Big Brown (a Kentucky Derby winner himself) out of the Tale of the Cat mare Josephina. He was ridden by Martin Garcia and is trained by Bob Baffert. He paid $3.20 to win, $2.40 to place, and $2.10 to show. Dortmund earned 100 points for his victory bringing his total up to 170 points on the Kentucky Derby Points Leaderboard. One Lucky Dane earned his first 40 points, Bolo earned 20 points to bring his total up to 30, and Prospect Park earned 10 points to bring his total up to 30 points as well. 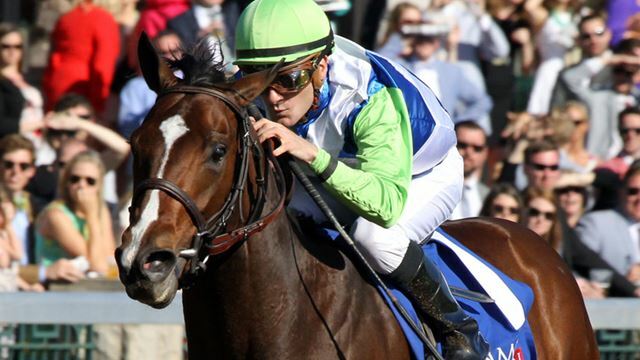 The final weekend of the Road to the Kentucky Derby will be next weekend. The Grade 1 Arkansas Derby and Grade 3 Lexington Stakes will be held next weekend as a last chance to make the Kentucky Derby field. It was smooth sailing for Carpe Diem in the Grade 1 Blue Grass. He pressed the pace and then drew away in the stretch to win by 3 lengths over Danzig Moon. Ocho Ocho Ocho went straight to the lead as expected and Carpe Diem was right there on his flank from the start. Gorgeous Bird sat third by 2 1/2 lengths, Classy Class was fourth, and Danzig Moon was in fifth. Pepper Roani was sixth, Frammento was seventh by 9 lengths, and Unrivaled was well behind in last by 11 lengths. The top two continued to go around the turn and on the backstretch with little inclination to push forward too quickly. Gorgeous Bird still sat third on the backstretch and entering the far turn with Classy Class poised to go past him on his right flank. Danzig Moon was fifth, Pepper Roani was sixth, Frammento was seventh, and Unrivaled was still last. Entering the stretch, Carpe Diem was given his queue to go to the front and he did just that with little threat from the other runners. Ocho Ocho Ocho continued to battle after setting the pace, but finished third behind Danzig Moon. Frammento made enough of a rally to finish fourth by 7 1/4 lengths. Classy Class finished fifth, Gorgeous Bird was sixth, Unrivaled finished seventh, and Pepper Roani was last of eight by 14 1/2 lengths. The full chart can be found here via Equibase. Carpe Diem is by Giant’s Causeway out of the Unbridled’s Song mare Rebridled Dreams. He was ridden by John Velazquez and is trained by Todd Pletcher. He paid $2.80 to win as the 2 to 5 favorite. He also paid $2.40 to place and $2.10 to show. Carpe Diem earned 100 points for his win and now has 164 points total on the Kentucky Derby Points Leaderboard. Danzig Moon earned 40 points to bring his total to 45 points, Ocho Ocho Ocho earned 20 points to bring his total to 30 points, and Frammento earned 10 points to give him a total of 20. The final two races on the Road to the Kentucky Derby will be next week with the Grade 1 Arkansas Derby from Oaklawn Park and Grade 3 Lexington Stakes from Keeneland. A wide trip by Frosted was not a problem as he drew away in deep stretch to win the Grade 1 Wood Memorial by 2 lengths. Toasting Master broke best and went to the lead with Daredevil right there a length behind. Tencendur had a good spot in third, Tiz Shea D was fourth, and El Kabeir was near the back in fifth. Frosted was sixth, but three wide on the first turn with Lieutenant Colonel in last, but only 5 lengths off the lead. Toasting Master continued to lead on the backstretch while Daredevil crept closer and Tencendur still in third. Tiz Shea D was fourth, Lieutenant Colonel made an inside move to move into fifth, Frosted was still in sixth, and El Kabeir was back in last. Frosted started to make his move on the far turn when he went four wide, but he still had to catch Tencendur who got the first jump on the leader. It took until mid-stretch for Frosted to get the upper hand, but he pulled away to a 2 length win in the end. Tencendur finished second while El Kabeir came from last to finish third by 5 3/4 lengths. Daredevil finished fourth, Tiz Shea D was fifth, Toasting Master was sixth, and Lieutenant Colonel was seventh. Frosted is by Tapit out of the Deputy Minister mare Fast Cookie. He was ridden by Joel Rosario and is trained by Kiaran McLaughlin. He paid $6.40 to win, $4.50 to place, and $3.00 to show. He completed the one mile and one eighth in 1:50.31. Frosted earned 100 points to bring his total up to 113 points. Tencendur earned 40 points for a total of 41 points, El Kabeir earned 20 points for a total of 95, and Daredevil earned 10 points to bring his total to 20. The top two are virtual locks for the Kentucky Derby at this point via the Kentucky Derby Points Leaderboard. The Road to the Kentucky Derby ends next weekend with two races. The Grade 1 Arkansas Derby from Oaklawn Park and the Grade 3 Lexington Stakes from Keeneland. The final Road to the Kentucky Derby on Saturday will be the Grade 1 Santa Anita Derby. A small field of six horses will compete for $1,000,000 in the one mile and one eighth race. Both the Grade 1 Wood Memorial from Aqueduct and Grade 1 Blue Grass from Keeneland will be determined by the time the Santa Anita Derby goes off. The winner of this race will receive 100 points towards the Kentucky Derby Points Leaderboard. Second place will receive 40 points, third place will receive 20 points, and fourth place will receive 10 points. Post time for the Grade 1 Santa Anita Derby is scheduled for 6:30 PM Eastern Time and is the eighth of 11 races on the card at Santa Anita on Saturday. Free past performances for the Santa Anita Derby can be found here. 1. Dortmund (3-5 Morning Line) – The favorite has the rail for this race and he is clearly deserving of the low price. He is 5 for 5 in his career and won his stakes debut in a thrilling finish by a head in the Grade 1 Los Alamitos Futurity. He then had to hold off a game Firing Line in the Grade 3 Robert B. Lewis Stakes 6 weeks later on February 7. Dortmund had no trouble in his last race going gate-to-wire while easily winning the Grade 2 San Felipe Stakes. He will be very tough to beat in this race. 2. One Lucky Dane (5-1 ML) – Trainer Bob Baffert also saddles the heavy favorite to the inside. He ran third in his debut at Del Mar and then ran second by half a length in his next start. He crushed his foes in his third start by 9 1/2 lengths. Baffert was high enough on him after the maiden win to enter him in the Grade 1 Breeders’ Cup Juvenile. He had a bit of trouble, but was never a factor finishing sixth by 9 1/2 lengths. After more than a three month break, he came back on March 19 to crush an optional claiming race by 9 3/4 lengths. He most likely will not threaten his stablemate to the inside, but he could hit the board. 3. Cross The Line (15-1 ML) – He has run only at Golden Gate prior to this race. He ran second and third in his first two starts before breaking his maiden by 4 1/2 lengths at a mile in his third start. He followed that up with another victory Cal Derby by 1 3/4 lengths. He was then entered in the Grade 3 El Camino Derby where he ran a good second to Metaboss. He will still need to put forth a big effort to have a chance to hit the board. 4. Bolo (4-1 ML) – He finished fifth in his debut at one mile on the turf before breaking his maiden in his second start at a mile and a sixteenth by 2 3/4 lengths. He then made it back-to-back wins by crushing the Eddie Logan Stakes competition by 4 1/2 lengths. A break of over two months led to him being placed in the Grade 2 San Felipe on dirt. He ran very well in his only dirt start finishing 1 3/4 lengths behind Dortmund while falling to third late. He certainly figures to have a chance underneath here once again. 5. Prospect Park (7-2 ML) – He needed four starts to break his maiden, but he did so by a neck. He then went into an optional claimer where he made it two wins in a row by dusting the field with a 5 1/4 length win. Last time out, he too ran in the Grade 2 San Felipe and had no chance of threatening Dortmund, but did get up for second. He would not be a surprise if he finished second again. 6. Bad Read Sanchez (30-1 ML) – The longest shot in the race has not raced since August. He broke his maiden in his debut at Santa Anita in June of 2014 by 10 lengths and was then sent to a listed stakes race at Los Alamitos. He ran a very good second and then ran a solid third in the Grade 2 Best Pal at Del Mar. He has decent works coming in, but he will probably need this race. #1 Dortmund is the best horse on paper and will probably improve his record to 6 for 6 lifetime. The race for second will come down to #2 One Lucky Dane, #4 Bolo, and #5 Prospect Park. #5 Prospect Park seems most likely to finish second while #4 Bolo could improve in his second start on dirt and #2 One Lucky Dane certainly has talent to make an impact here. A recap of the Grade 1 Santa Anita Derby will be posted on Saturday night. The second Road to the Kentucky Derby prep race on Saturday will be the Grade 1 Blue Grass Stakes from Keeneland. A field of 8 has been entered for this $1,000,000 race going one mile and one eighth on the main dirt track. The other two races on Saturday are the Grade 1 Wood Memorial and the Grade 1 Santa Anita Derby. The winner of the Blue Grass will receive 100 points towards the Kentucky Derby Points Leaderboard. Second place will receive 40 points, third place will receive 20 points, and fourth place will receive 10 points. Post time for the Grade 1 Blue Grass is scheduled for 6:00 PM Eastern Time and is scheduled as the tenth of 11 races on the card. Free past performances for the Blue Grass Stakes can be found here. 1. Ocho Ocho Ocho (6-1 Morning Line) – He won his debut at Santa Anita before destroying an off the turf stakes race by 5 3/4 lengths. He was then shipped to Delta Downs for the Delta Jackpot where he won by a nose over Mr. Z. After a break of two and a half months, he tried the Grade 2 San Felipe where he had some trouble, but was overmatched against Dortmund and finished eighth beaten 15 lengths. He avoids Dortmund here, which may be enough to hit the board against this field. 2. Gorgeous Bird (8-1 ML) – He started with a sixth place finish at Saratoga before breaking his maiden in his second start at Churchill. A two month break was followed by a 7 length win on January 24 at Gulfstream. He then tried stakes competition for the first time in the Grade 2 Fountain of Youth, but was never in contention finishing fifth by 7 1/2 lengths. He will need to do much better to contend here. 3. Pepper Roani (12-1 ML) – He needed six starts to break his maiden and did so at Turfway Park on January 31. He then ran in the John Battaglia Memorial where he was a second by 5 1/4 lengths behind Royal Son. Royal Son came back in the Spiral Stakes, but was not a factor. Pepper Roani has raced once on dirt at Churchill, but was crushed by 11 lengths and finished eighth. He is a step below these horses and will need a career effort to make the top three. 4. Unrivaled (12-1 ML) – He started with two races at Indiana Downs and then came to Keeneland where he missed by a nose in a $30,000 maiden claiming race and was claimed out of that race. He was then shipped to Parx where he was second by 5 3/4 lengths and then crushed the maiden special weight competition by 15 lengths on December 23. His latest race was an allowance race when he came from well off the pace to win by 5 lengths. He will need to step up a bit to contend, but he is an interesting long shot. 5. Carpe Diem (1-1 ML) – The heavy morning line favorite returns the scene of his best race. After winning his debut by 2 1/2 lengths, he came to Keeneland and dominated the Grade 1 Breeders’ Futurity by 6 1/4 lengths. He then went into the Grade 1 Breeders’ Cup Juvenile and was a good second behind runaway winner Texas Red. His three year old debut was another good performance as he won the Grade 2 Tampa Bay Derby by 5 lengths. He is the heavy favorite and squarely the one to beat. 6. Frammento (8-1 ML) – He broke his maiden here at Keeneland in his second start and then ran in back-to-back optional claiming races. His last two races were at Gulfstream in back-to-back graded stakes. He first ran in the Grade 2 Holy Bull, but finished a well beaten sixth by 18 lengths behind Upstart. He then ran in the Grade 2 Fountain of Youth where he made a strong rally in the stretch to finish third. If he gets enough speed, he could hit the board here. 7. Classy Class (6-1 ML) – He has raced exclusively in New York prior to this race. 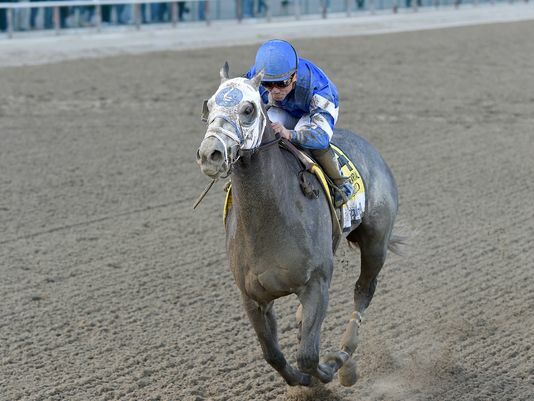 He won his debut by four lengths at Belmont and then tried the Grade 2 Remsen Stakes. He was fourth that day and then took two months off and returned to Aqueduct. He was third in the Grade 3 Withers after setting the pace and then finished third again in the Grade 3 Gotham Stakes after coming from off the pace. He is a versatile horse and that makes him a threat for an exacta or trifecta finish. 8. Danzig Moon (8-1 ML) – He made his debut here at Keeneland and finished fourth at six furlongs. He then went to Churchill and finished second in a maiden race before getting a short break. He resurfaced at Gulfstream where he broke his maiden by 4 3/4 lengths. His first foray after his maiden breaking win as in the Grade 2 Tampa Bay Derby where he ran an even race and finished fourth by 12 lengths. He will need to improve dramatically to have a chance here. This race comes down to #5 Carpe Diem. He is the class of the field, his best career race took place here at Keeneland, and he should be in the perfect spot. The race for place and show is a tougher to discern. For the sake of value, #4 Unrivaled looks good at 12-1 while #7 Classy Class is a consistent horse. #1 Ocho Ocho Ocho does not face Dortmund, which that alone could allow him to hit the board. #8 Danzig Moon could improve and #6 Frammento will need a hot pace to have a chance, which does not appear to be there on paper. Check back on Saturday evening for a recap of the Grade 1 Blue Grass Stakes. As the Road to the Kentucky Derby enters its final two weekends, there is still plenty up for grabs including potential spots in the starting gate for the Kentucky Derby. On Saturday, the first of three prep races (the other two being the Grade 1 Blue Grass and the Grade 1 Santa Anita Derby) will be run starting with the Grade 1 Wood Memorial Stakes from Aqueduct. A field of 7 horses entered the race and will be going one mile and eighth for a purse of $1,000,000. Outside of the whopping purse offered, there are 100 points that will be given to the winner of this race towards the Kentucky Derby Points Leaderboard to help determine the 20 starters in the Kentucky Derby. Second place will receive 40 points, third place will receive 20 points, and fourth place will receive 10 points. Post time for the Grade 1 Wood Memorial Stakes is scheduled for 5:30 PM Eastern Time as the tenth of 12 races at Aqueduct. Free past performances can be found here. 1. Tiz Shea D (8-1 Morning Line) – He has only two races in his career. He won his debut at Parx by 4 lengths going 5.5 furlongs. He was then turned over to the care of trainer Bill Mott where he was entered in the Grade 3 Gotham Stakes. He ran a very good race in his second career start and first going a route of ground by finishing second by 2 3/4 lengths behind El Kabeir. His rail draw should have him in a great spot here if he is good enough. 2. Toasting Master (20-1 ML) – He has started six times in his career and began by winning two of his first three races. He was then entered in the Spectacular Bid Stakes at Gulfstream Park where he was sixth. He then tried a route for the first time in the OBS Championship, but finished fourth that day. He too was entered in the Gotham Stakes, but could only muster another fourth place finish after setting the pace. He he weakened going 8.5 last time and this is half of a furlong farther. 3. Lieutenant Colonel (15-1 ML) – Like his counterpart on the rail, he too has had only two career starts. He won by a head at Gulfstream in his debut going one mile and was then shipped to New York for the Gotham Stakes. He did not have a good break and was never in contention while finishing last of 10 horses that day. He is probably better than he showed in the Gotham, but we may not see it here in the Wood Memorial either. 4. Frosted (5-2 ML) – He broke his maiden in his third start after starting his career with back-to-back second place finishes. He then ran in the Grade 2 Remsen where he missed by half a length and then took some time off and headed south. He was second in the Grade 2 Holy Bull behind a dominant Upstart and then ran in the Grade 2 Fountain of Youth. He had the lead in the stretch, but ultimately finished fourth in a rough stretch run. He should have a good spot behind the front runners in this race. 5. El Kabeir (3-1 ML) – El Kabeir has seen his name all over the Kentucky Derby prep races in New York. He began the year with an easy win in the Grade 3 Jerome by nearly five lengths before being run down by Far From Over in the Grade 3 Withers Stakes and finishing second. He bounced back in an odd way in the Grade 3 Gotham Stakes. He had to come from way behind, which is opposite of his normal stalking and pressing style. It did not matter as he won by 2 3/4 lengths over Tiz Shea D. He certainly makes sense in this spot. 6. Daredevil (9-5 ML) – The morning line favorite began his career at Belmont with a smashing debut win by 6 1/4 lengths. He parlayed that into a 2 1/2 length win in the Grade 1 Champagne Stakes, also at Belmont. He had a poor trip in the Grade 1 Breeders’ Cup Juvenile on his way to finishing 11th, beaten nearly 26 lengths. He came back in March and ran second by 2 3/4 lengths in the seven furlong Grade 2 Swale Stakes. If he is ready (or if there is a sloppy track), he will be tough to beat. It is worth noting he needs to finish first or second to make the Derby. 7. Tencendur (12-1 ML) – He has yet to leave the state of New York to race, but that has worked out just fine for him. He was third in his debut and then broke his maiden second time out while going into New York bred competition. He then finished fourth in the Grade 3 Withers by 4 lengths in an even race and then could not rally to finish better than fifth in the Grade 3 Gotham Stakes. He will need a hot pace to make a big impact here. There is a reason #4 Frosted, #5 El Kabeir, and #6 Daredevil are the favorites. #5 El Kabeir has done little wrong in New York this prep season and his last race was excellent. He can rate, press, or close if need be and he is the top choice here. #1 Tiz Shea D is probably a step below the top trio, but if he can get a good trip, he could round out the exacta. #6 Daredevil has three really good races and if the track comes up sloppy, he will be hard to beat. #4 Frosted may find it a bit easier against this group, but he needs to run better than his Fountain of Youth last out. Check back on Saturday evening for the recap of the Grade 1 Wood Memorial as well as the Santa Anita Derby and Blue Grass Stakes.